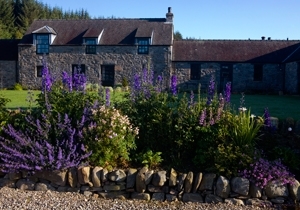 Grenich Steading is a conversion of a traditional farm building built around 1800. The restoration of the exterior received an award from the Association for the Protection of Rural Scotland and was completed in 1996. 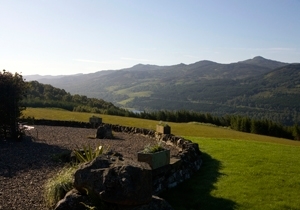 The building is situated 1000ft above sea level and overlooks Loch Tummel with spectacular views of the hills to the south. 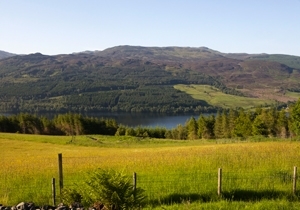 Strathtummel is an ideal area for walkers and nature lovers. There are a number of walks to suit most people within a mile or two by car to the start. A climb up Schiehallion, the fairy mountain and the centre of Scotland ,is recommended on a clear day giving you breathtaking views for miles around. After a strenuous day in the hills you might like to take it easy on the two hour train ride from Rannoch Station on the West Highland Line to Mallaig, a small fishing port on the west coast. You will go through spectacular scenery and over the Glenfinnan viaduct as in the Harry Potter film. After a delicious lunch in the Fishmarket Restaurant you get the train back to Rannoch Station. For those who prefer gentler excercise there are several lovely gardens to visit in what is known as Big Tree Country. There is Blair Castle with it`s thirty rooms and restored gardens to enjoy. A working flour mill in Blair Atholl should not be missed and enjoy their delicious bread. A few miles on , the House of Bruar is a tempting stop offering the best of everything Scottish from the unforgettable food hall to wonderful knitwear and tweeds and sporting gear to suit all tastes. The four distilleries in the area including the charming smallest distillery in Scotland. The Pitlochry Festival Theatre offers evening entertainment with a varied programme of plays during the week. They offer pre theatre dinner before the show in their excellent restaurant. There are a number of very good eating places in the area within ten miles of Grenich. Loch Tummel Inn, just a mile from the house, for guests who prefer not to drive far, has very good food. You can spend a day exploring the area including Glen Lyon the longest glen in Scotland and stop to marvel at the Fortingall Yew, said to be 5000yrs old. During your stay you should see red squirrels and ospreys and red deer on Rannoch Moor. 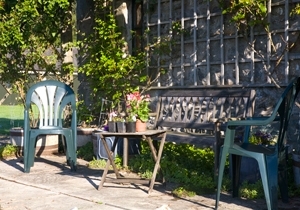 The house is surrounded by a large garden and visitors have their own patio to sit and enjoy the view. 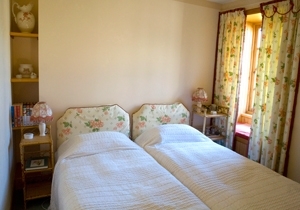 The accommodation consists of two bedrooms and a bathroom and has a private sitting room with a door into the garden. Only one booking is accepted at any one time be it for two or four guests so that you will not be sharing with strangers and have exclusive use of the bathroom and sitting room. 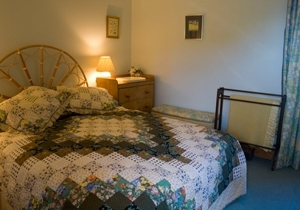 It is possible to take the accommodation on a self catering basis for a minimum of a week. 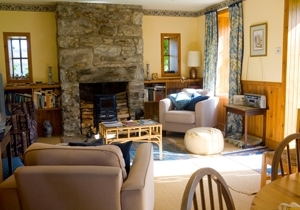 There is a small kitchen area at the end of the spacious sittingroom.